So he got up, took the child and his mother during the night and left for Egypt, where he stayed until the death of Herod. And so was fulfilled what the Lord had said through the prophet: “Out of Egypt I called my son” (Matthew 2:13-15). but he frustrates the ways of the wicked (Psalm 146:9). A church in Indianapolis has pulled its statues of Jesus, Mary, and Joseph out of storage at an unusual time of year. While a lot of churches have the holy family set out on their lawns in a nativity scene during the Christmas season, they don’t usually come out in the middle of summer. But Christ Church Cathedral decided to haul theirs out to make a statement. 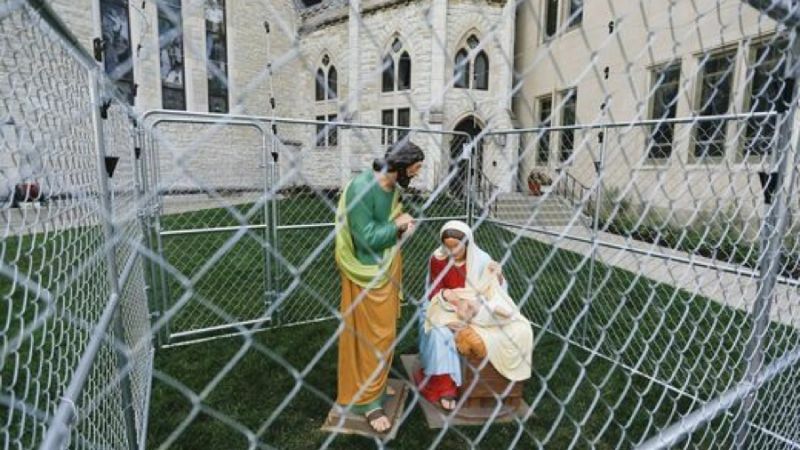 Instead of the usual stable, Joseph, Mary, and the baby Jesus have been placed inside a chain-link fence on the church’s lawn. The intent, as you’ve probably guessed, is to mirror the situation that many immigrant families on our borders — especially our southern border — find themselves in. While families are no longer separated at the border, they now are being detained together indefinitely according to the administration’s revised policy; however, not all families have been reunited. “Holy Scripture is clear about how we are to treat people trying to find safety for their families — we are to show mercy and welcome them,” said Steve Carlsen, dean, and rector at the Cathedral. He went on to say that Jesus, Mary, and Joseph “call us to stand with all families seeking safety and a future for their children,” and that, "We must not be divided by race, language or culture, but reach out to care for our neighbors — because every family is sacred” (Matthew 22:35-40). Mr. Carlsen is, of course, referring to the fact that the Gospel of Matthew tells the story of Joseph taking his wife and newborn son to Egypt to escape King Herod’s murderous intentions (Matthew 2:7-15). In the gospel, the story functions more as a meditation on the strange twists the fulfillment of prophecy can take. In our world, though, it takes on a little different meaning. Jesus began his life as an immigrant asylum-seeker — like those from Central America who have entered the U.S.A. through the border with Mexico to protect their children from the rampant gang violence in their home countries. The Bible shouldn’t always confirm what we already believe. Sometimes it should upset our beliefs. Jesus was born into a world that didn't have a place for him and his family (Luke 2:1-7), into a world that would just as soon exterminate them (Matthew 2:1-18). His family left their livelihood, family, and everything they knew behind to give their new son a chance at life. To the degree that any family in our world has to make that decision, we’ve failed as a race. 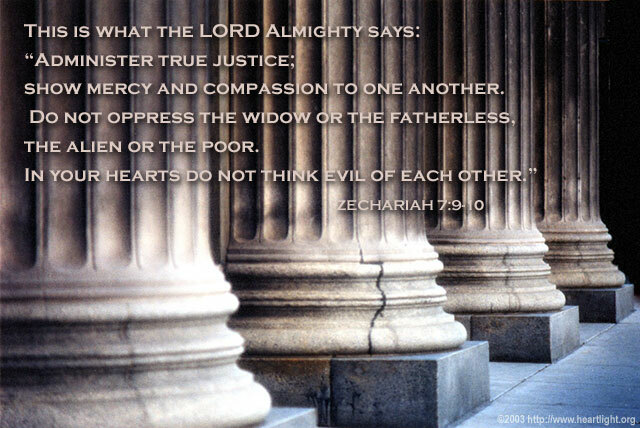 To the degree that we don’t show compassion and mercy to those who are forced into that decision, we’ve failed as a church. One of the things I appreciate about the statement Christ Church is making is that it offers us an alternative way of reading Scripture. I think that’s pretty important, especially when administration officials are quoting Romans 13:1-5 as a way of telling believers that we should be quiet and meekly submit to what the government tells us is right. (As if Paul would have ever stood for that!) The Bible can be and has been used to justify some of the most horrific abuses in human history — often by the very governments carrying out those abuses. It takes some discretion, some critical thinking, to read the Bible well. Christ Church takes the story of the flight to Egypt and uses it to make us think about what the “old, old story” of Jesus tells us about this very contemporary issue. I know a brother in Christ who thinks that the church, in its zeal for interpreting and explaining individual Bible texts, sometimes misses the big picture. He thinks we read Scripture in a way that misses the forest for the trees. I think he might be onto something, even if it’s not what he thinks it is. My take? It isn’t so much a “miss the forest for the trees” problem; it’s that we ignore a large percentage of the trees — unfamiliar trees, of a species we can’t identify at first glance — and focus on a small grove here and there that are familiar territory. The Bible is a vast wilderness, and we tend to leave a lot of it unexplored and untouched. You know those parts in your Bible where the pages are still stuck together? Yeah, they’re Scripture, too. And if the Bible is as important as we claim it is, then leaving large chunks of it untouched leaves our faith impoverished. If the sight of the Holy Family caged up on a church lawn makes your blood boil a little, you might ask yourself what it is that’s bothering you about it. The Bible shouldn’t always confirm what we already believe. Sometimes it should upset our beliefs. Sometimes it ought to wreak a little havoc in our value systems, overturn some tables, bust some holes in old wineskins. Maybe, if this shocking display bothers us, it’s because it’s allowed a previously unexplored bit of Scripture to burrow its way to be right where it should be: under our skin. I can already hear some believers saying that this is too political, that a church should concentrate on preaching the gospel and not take sides in a political debate. I get that, I do. In a lot of ways, I sympathize with it completely. Some of the spiritual ancestors I most admire would have said the same thing. They probably wouldn’t have taken a position on the subject, or had any confidence that anything other than political gain motivated one party. But, here’s where they would have parted company with some I know who decry politics in the church: they would have gone out and served immigrant families in the name of Jesus. They would have gotten to know them, loved them, cared for them, and helped meet their needs because they would have known that the gospel correctly understood, pushes us and nags at us to love the most vulnerable among us. They’d make their churches places of welcome. For some of us, worries about the church being “political” are a smokescreen. This smokescreen allows us to use our faith as a blindfold to keep from having to see the suffering of real people — like Joseph and Mary having no family willing to take them in when Jesus was born and having the leader of their people force them to flee for safety to another country where they were unwanted. It strikes me that I can’t seem to decide whether this is a post about immigration or reading the Bible. Turns out it’s both. That’s as it should be since our opinions about the one should be formed by the other. If someone needs to break out a nativity scene a few months early to remind us, so be it. When you are harvesting in your field, and you overlook a sheaf, do not go back to get it. Leave it for the foreigner, the fatherless and the widow, so that the LORD your God may bless you in all the work of your hands. When you beat the olives from your trees, do not go over the branches a second time. Leave what remains for the foreigner, the fatherless and the widow. When you harvest the grapes in your vineyard, do not go over the vines again. 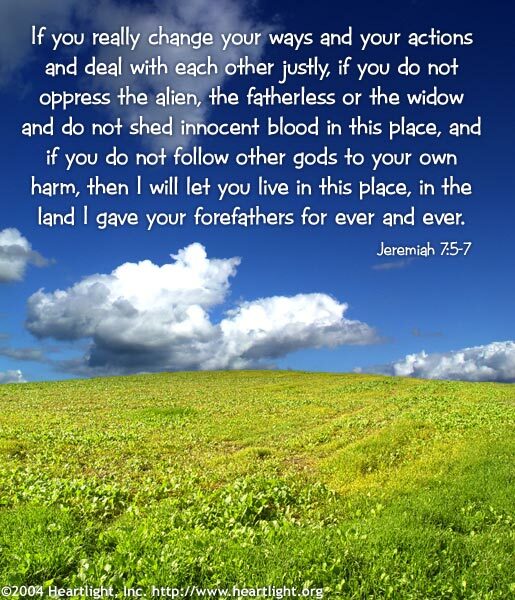 Leave what remains for the foreigner, the fatherless and the widow (Deuteronomy 24:19). I Doubt It: The Fields are White! "The Holy Family, Incarcerated!" by Patrick D. Odum is licensed under a Creative Commons License. Heartlight encourages you to share this material with others in church bulletins, personal emails, and other non-commercial uses. Please see our Usage Guidelines for more information.